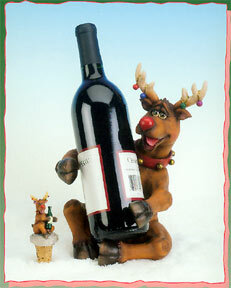 A "lit up," happy reindeer holding onto his bottle with a very silly grin on his face! Wonder what he's been up to, eh?! There's a matching bottle topper to go along with this fun bottle holder. A perfect way to dress up your house for the winter or give as a gift to put a smile on their face! Great holiday gift idea! Continuing this line of creative whimsical accents for your home, we've added unique corkscrew holders (corkscrew IS included) can be used to hold your glasses, keys or even your remote control! A perfect addition to your bottle holder collection and a great gift for guaranteed grins & giggles! And be sure to check out the Kooky cookie jar sets too! What fun!